Lunchtime. Have had this on my wish list for some time - cycled here (c 40 miles) and was very thirsty so was disappointed that the eaters were taking so much of the bar person’s time that she didn’t acknowledge me for about 5 minutes. Rather limited choice of beer as well. Ho hum. Quiet on a Tuesday evening.The parish council were expected,but were running late. Tonbridge - Old Chestnut 4.40 Dark,fruity.Serious malt. Brief visit on Remembrance Day afternoon:an armistice-themed tune up was in progress.Busy. A Poppy Day beer from Marston's was available. Harvey's - Sussex Best Bitter 4.00 Unimpeachable. Mid evening on my way home from a meeting.Quite busy for midweek: I must have been the oldest there. Harvey's - Sussex Best Bitter 4.00 Decent Harvey's. Late on a Saturday afternoon.Busy with drinkers indoors and out. Musket - Muzzleloader 4.50 Smoaky dark chestnut best bitter.Steadfast and dependable. Late afternoon.Hot.I'm rather fractious because our router died in a thunderstorm. Leighton Buzzard - Cuckoo 3.80 Old school, but dull old school. A few drinkers enjoying the afternoon sun on a Bank Holiday Saturday. Vale - VPA 4.20 Assertively hopped Golden Ale.Moreish. A rare mid week evening visit. A few old boys looking at the football. Harvey's - Sussex Best Bitter 4.00 Not at its best.Ripe fruit. Early Friday evening. Busy. A proper pub. Tonbridge - Old Chestnut 4.40 Chestnut-brown. Very maltly with a bitter finish. Doesn't quite work. 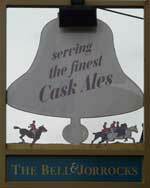 The pub is found in Frittenden, Kent, TN17 2EJ. Tile hung, timber framed pub in the centre of the village. It incorporates the local Post Office. In 1967, Fremlins was taken over by the brewers Whitbread, and in 1969 after 65 years the licensee of The Bell retired. It was at this point that plans were made to combine both The Bell and the John Jorrocks pubs. 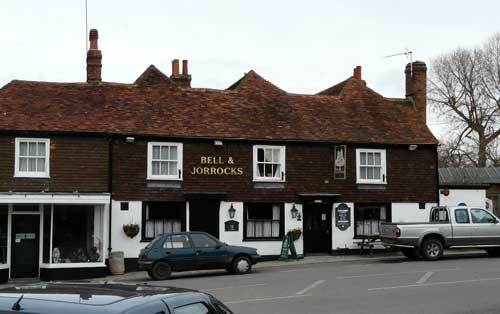 The John Jorrocks was closed, and the Bell was renamed The Bell & Jorrocks under the tenancy of Phil Oliver, the former tenant of the Jorrocks. Local CAMRA branch Pub of the Year 2015 and again in 2018. CAMRA West Kent Pub of the Year 2015. We have visited this pub 52 times, seen 78 different beers and tried 66 of them.